Abandon all hope, ye who choose the gang life. That’s the premise of Erika T. Wurth’s new novel, a striking, heartbreaking blend of romance and violence set in and around Albuquerque. 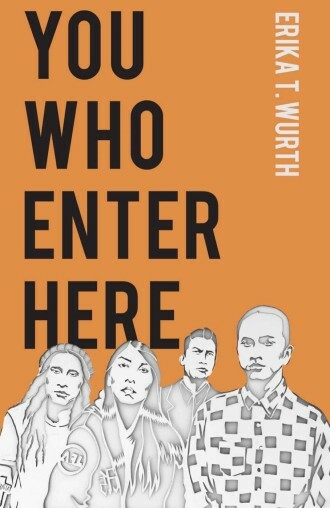 Typically for Wurth, You Who Enter Here offers an unflinching perspective on contemporary Native American life. But the central conflict of the novel is a love triangle, which offers a doubled reading experience: one eye on a fatalistic, bloody tale, and the other on a tender, moving story of star-crossed lovers. Matthew has come from a horrible home life full of abuse and instability. Alcoholism stalks him, a malevolent shadow, and he is self-examining enough to know that there is nothing special about him and the life he has chosen in a Native American gang, the 505s. “That was something Matthew learned early on: he was not unique, there were more of him, more and more—a line leading out into the desert, a line of brown men who looked just like him, who had backgrounds just like his, full of anguish and abandonment and pain.” Not so for Chris, Matthew’s mentor, an ambitious, bloodthirsty young star in the 505s. Chris is obsessed with self-glorification through indiscriminate murder and foolhardy crimes, and one of the novel’s throughlines is Matthew’s slow disenchantment with Chris’s grandiosity. She comforted him as he held her, and she moaned and trembled like a child, and he began to feel the grayness parting—a little light coming in like it was one of those days where it’s been gray for far too long and the beauty is too much to bear and you stop believing in the sun and then suddenly, yes, there it is, coming up over the clouds so perfect and new, parting the gray forever. The affair tests Matthew’s loyalty to Chris even more than Chris’s egocentric leadership does. Meanwhile, the 505s decay in reputation and membership, until there is almost nothing left for Matthew except the death he has always believed would find him. The novel is less specifically focused on Native issues and the many manifestations of Native life and culture than Wurth’s last book, the short story collection Buckskin Cocaine. But that book, despite its rotating cast of narrators and its fragmentation of collective experience, is less thematically complex than You Who Enter Here. The tenderness with which Wurth narrates moments Matthew and Maria share, the beauty of the love between them, contrasts but does not jar with the ugliness of Matthew’s profession (and his alcoholism). It’s like a garment composed of two types of fabric seamed together invisibly. And Wurth may be hitting the same ideas repeatedly in the novel—how gangs require leadership like any organization, the nature of trust, holding the capacity for love and death in the same body—but she revisits them with tiny variations each time, until every idea has been fully, devastatingly explored. One idea that remains in the subtext of the novel is Wurth’s choice to write such an accomplished, involving book about characters that most of us hate and fear. Gangs are scary; drug addicts are shunned; murderers are slipped securely out of sight, so that ordinary folk can live their lives without considering the common humanity we share with these groups. There’s a message here about how society perceives minorities (like the Native Americans and Latinos that mostly make up the gangs in You Who Enter Here), how white people elide minorities with criminals without recognizing the inner lives, the choices, and the vulnerabilities that drive and haunt them. The reader is forced to empathize with a man walking toward his own death, and causing so many other deaths along the way; forced to understand fully what’s inside his body and mind. It’s a risky move, and a wise one. And it’s part of what makes Wurth’s novel such a darkly splendid achievement. Through Matthew, Wurth unpacks assumptions and crashes through barriers to empathy. His life is not scary, but exhausting and sad. He moves through it like Dante in the underworld: as if he has no choice but to enter, and no option but to keep going.